You don't need to be a photography equipment GearHead to want to know how you use your equipment. 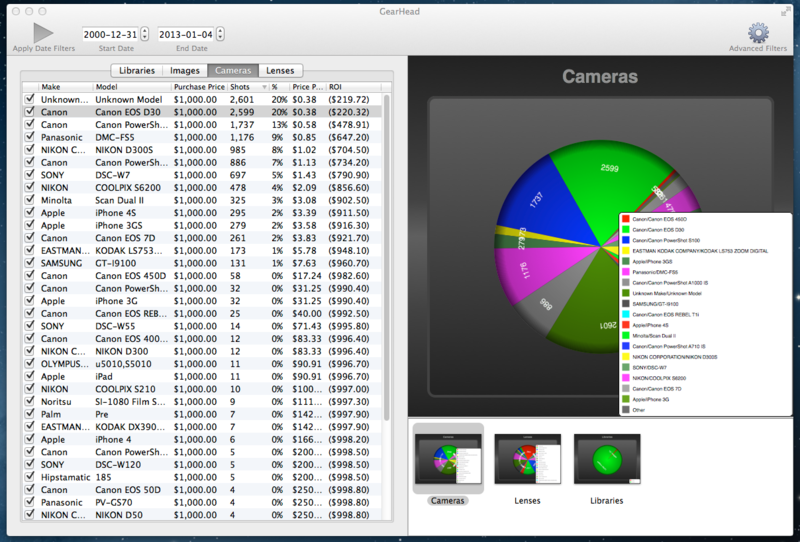 GearHead will analyze your image libraries providing statistics on the cameras and lenses used. Reveal how you use your equipment. Do you shoot mostly in landscape or portrait? Which lenses do you use the most? How often do you fire the flash? When do you take the most pictures? etc... All these questions will be answered. Return on investment, cost per shot, and other statistics. 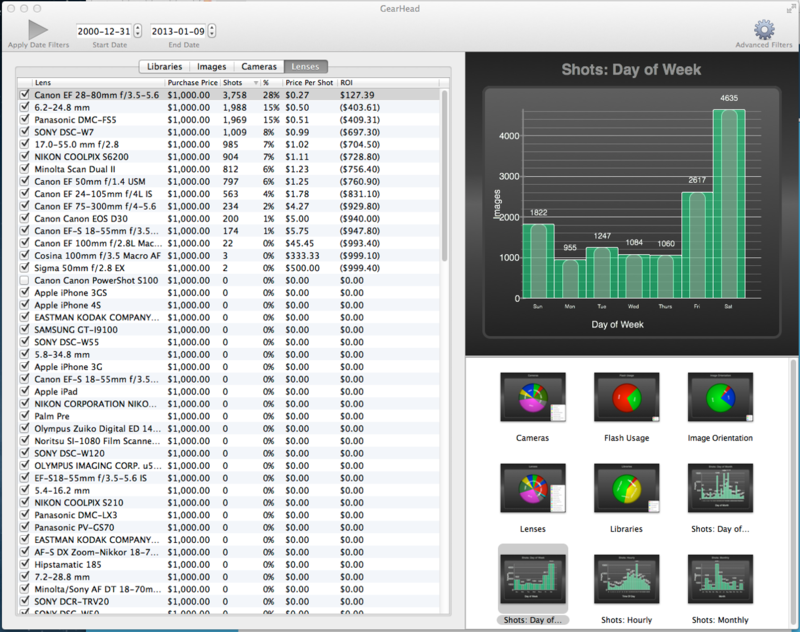 Visualize usage data with built in charts and graphs. View images right within the application. Filter statistics based on date ranges and image star ratings. Ignore equipment not of interest. Live data and visualizations. Changing filters provides immediate feedback. Export GearHead Data to CSV, XML, or SQLite for your own custom analysis. The demo version supports a single library and the ability to export image metadata for external analysis is disabled. Visit the GearHead Support Page. V1.3.2 Rating filter remains in effect when date filter is applied. V1.3.1 Critical bug fixes for application hangs and crashes under certain circumstances. V1.2.1 √ New Focal length graph. √ Chart annotations when clicking on pie slice or bar for more information on the object. √ Bar charts now include a % axis. √ Bug fix a leak on chart resizing.